Review: Most of the 3D movies coming out these days are simply exploits by the film companies to cash in on the present 3D craze. This is NOT one of those films. 3D is everything in this presentation. If you are not able to see it in IMAX 3D I wouldn't bother. The movie is fascinating when it comes to explaining the difficulties in having to repair and upgrade a technological marvel. 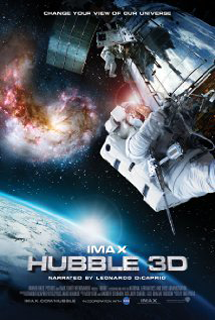 But,in 3D you are put seemingly inches away from an astronaut who is prepped for the coming mission, and right there as astronauts try to install new equipment into tight-fitting spots on the telescope. But, to me, the real worth of this film is seeing the expanse of the universe in 3D and seeing the incredible beauty of what is out there. You cannot possibly experience this without the 3D. As the telescope zooms through galaxies we see stars fly into the audience and past us as we reach deeper into space. I guarantee that most, after having seen this wonderful film in 3D will admit that they previously had no real concept of the vastness of space, and the endless billions of galactic bodies. Only the 3D experience makes it possible to wrap our brains around at least a small degree of understanding of how big our universe is, and the infinite galaxies which seem exist, let alone the billions and billions of stars(to quote the late Carl Sagen). I rate this 8 out of 10, subtracting 2 stars (no pun intended) because the film left me craving for more scientific explanation about the amazing details of the spacial orbs and expanses we see visually.